Medieval style wedding dress is perfect for a royal wedding. 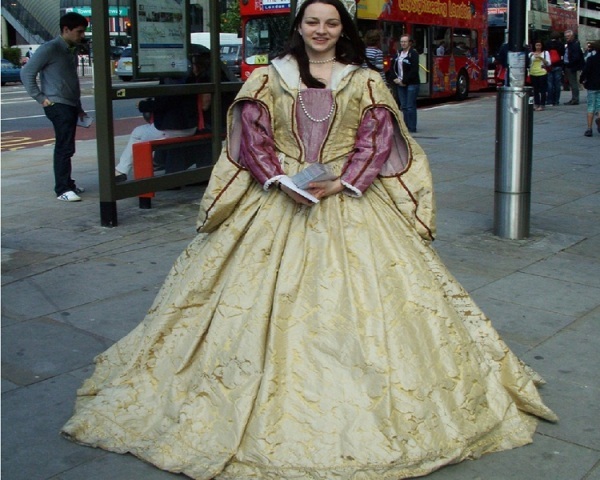 Find out more about medieval wedding gown. Turn the pages of history and you would definitely be amazed at the romance of kings, queens, princes, princesses, knights and maidens! Truly, medieval age was the most romantic period that universe has ever seen. Weddings with medieval theme are a huge hit even today and give way to be the supremely romantic nuptials. Most of the couples choose this theme, to add a touch of royal glamour and charm. As the name suggests, such weddings include rich fabrics and elaborate touches. If you are getting married in winters, you can very well pamper yourself with an authentic dress, which can be quite heavy. However, for summers, many specialist medieval wedding dress designers even prepare dresses in lighter fabrics. Thus, both the bride and the groom can choose from a wide variety of dresses that are available in different fabrics, colors and styles. For more on medieval wedding gown and dress, read on. Medieval dressing best suits the months of winter. So, if your wedding is taking place in the winters, just go for it. You can go for dresses that are elaborate and detailed. However, if your wedding is during the summer heat, do not worry, as a lighter version of the same is also available. In case your wedding is taking place in the chill winter months, the best bet would be to go for dress with full sleeves. The wedding gowns can be best complimented with matching cape or cloak. A major difference between the medieval wedding dresses and the ones that are in vogue today is the use of colors. While rich and vibrant colors symbolized the kings and queens weddings, the gowns available today are mostly in white (replicating the Victorian era). If you are all set to have a medieval style wedding, let it be then. Go for a color that truly depicts the imperial charm. Right from burgundy to deep green and blue, the options are endless. Make sure you have touches of gold and silver as well. Coming to the fabric, elaborate ones were the best deal for the dresses of that era. Go for velvet or silk with brocade. These fabrics would give the royal feel and touch that you always craved for. Frills and shiny materials can also be incorporated in the dress. For a traditional medieval wedding dress, go for priceless lines and drop waists. Full skirts, wide sleeves, deep cleavage and a lace up back would truly reflect the magical look of the bygone era. For those of you who want to symbolize the ultimate women of love, a gown that is done in Juliet style will be a great idea. This way, you would be known as the ultimate bride of love for years to come. To add the finishing touch, go for a veil made from wreaths of ivy, herbs and flowers, with ribbons attached and hanging loose over the back of the head. This would complete your look as a regal medieval beauty. As for the groom, tights, breeches, tunics, pirate shirts, laced vests, and boots are the order of the day for a medieval wedding. Coming to the hairdo, the longer it is, the more traditional you would look. All you need to do is gel the hair well and leave it loose. Just adhere to the tips given above and you would surely have one of the most majestic and grandiose wedding! !